Whispered tales speak of an eldritch tome crafted by necromancers and filled with spine-chilling facts about a vile menagerie of undead horrors - unnatural things known to haunt the gloom-filled corners of the world and beyond. Beware! This is that tome. 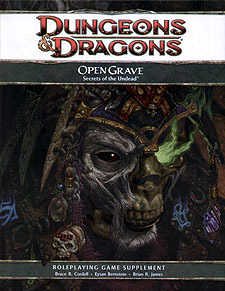 This supplement for the Dungeons & Dragons Roleplaying Game explores the origins, tactics, myths, and lairs of undead creatures. Along with encounters and hooks for your campaign, it presents a host of undead threats, including new varieties of ghouls, skeletons, vampires, wraiths, and zombies. It also introduces new kinds of undead and provides statistics for unique undead villains such as Acererak and Vecna.